Kubla Ports provides an interactive 3D environment where you can plan, design and manage all of your coastal assets. Assets can be viewed in a top-down 2D view for ease-of-use, or in realistic 3D view to validate data and to produce impressive visualizations for project stakeholders. 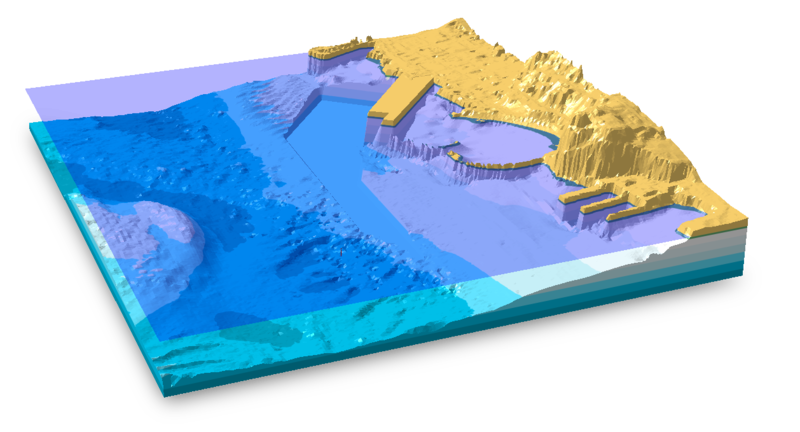 Bathymetry data can be loaded from a wide range of sources, or even traced on top of imagery if no digital data is available. The terrain can be shaded based on levels. It can also be vertically exagerated to make it easier to visualise subtle changes in bathymetry levels. The Channels Module of Kubla Ports allows you to determine channel widths and depths based on the concept design methods described in PIANC’s document ‘Approach Channels – A Guide for Design’. Once you have defined the site conditions (bathymetry, wind, waves, etc.) and the design vessels which will use the channel the software will automatically determine required widths and depths. The immediate calculations of dimensions makes Kubla Ports and extremely powerful tool for the concept design of approach channels and allows the users to consider different options in terms of alignments, design vessels and other design considerations. Dredging volumes will also be calculated, and if you have the Nav. Markers Module you can define lateral markers. The Dredging and Reclamation Module of Kubla Ports allows you to draw (or import from dxf) dredging or reclamation areas, such as terminals, berth pockets and turning circles. When you have also defined the dreding or reclamation level the software will instantly calculate volumes, areas and thicknesses and present maps showing either depths or levels. Surfaces can be instantly visualised in both 2D and 3D. 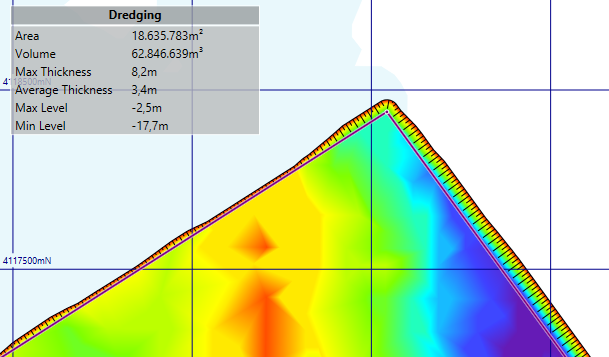 The Dredging & Reclamation Module will also calculate the volume of materials in the side slopes based on the batter angle which you define. You can either define side slopes for the entire element, or you can set the batter for individual edges if they vary for each side. The Nav. Markers Module of Kubla Ports allows you to draw Aids to Navigation on the screen and specify what type of marker they are. All standard marker type and structure types are supported. 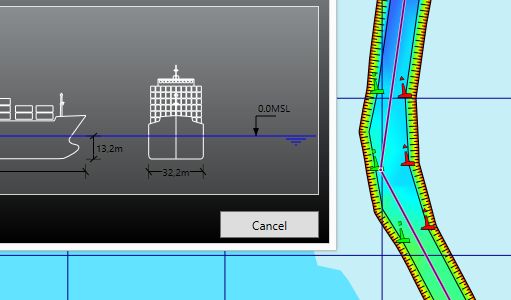 The seabed level at the location of the marker will be automatically calculated and displayed. 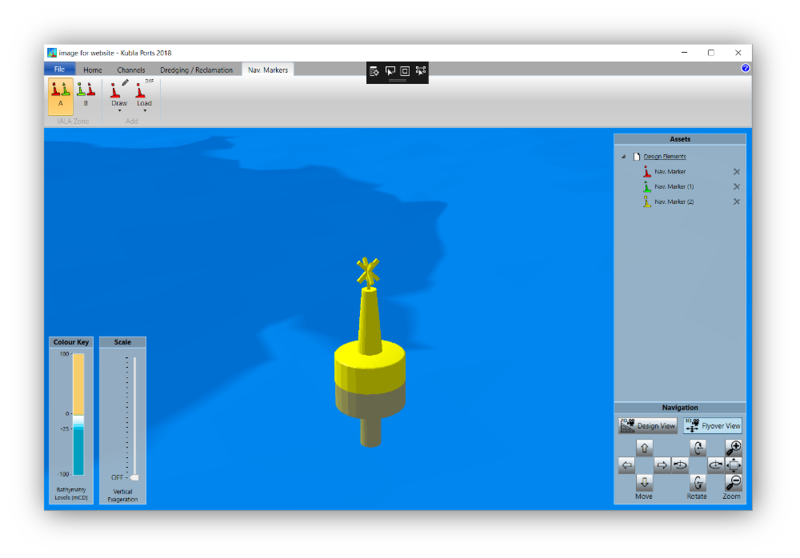 The Aids to Navigation can be exported to a summary which will list details of each marker, as well as to a CAD dxf file, which can be used with CAD software to create impressive visualisations for presentations. As with all other entities in Kubla Ports, files can be attached to Nav. Markers allowing it to be used to record maintenance reports, condition photographs and other relevant documents. Every item in Kubla Ports can have files connected to it. Furthermore, the powerful tree structure allows these files to be organised as the user requires. This makes Kubla Ports a powerful document management tool, and documents can the attached to every 3D entity and at any level of detail. For example, you can connect and inspection report to a navigational marker or to one component of the marker, such as the lamp. With Kubla Ports you can record every stage of the planning, design and management process and connect them to entities in an integrated 3D environment. 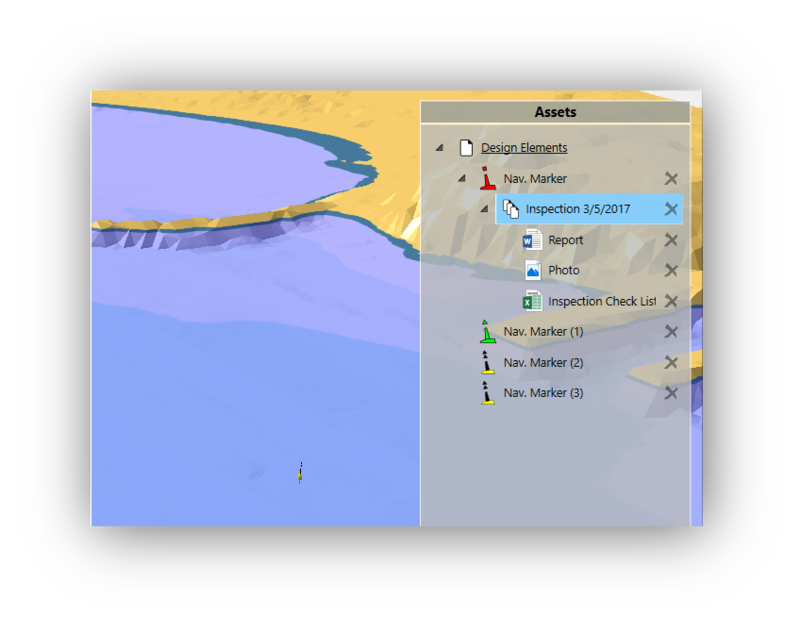 Use cases include using Kubla Ports to record the design process and design reports, and recording the maintenance of coastal assets throughout their operational life.